Fluoride used by Nazis to pacify Jews? By Becky Bowers on Thursday, October 6th, 2011 at 8:09 p.m. Some people say Nazis used fluoride to pacify Jews during World War II. Here's a reason to support a Florida county's decision to cut fluoride out of its drinking water: The idea came from the Nazis. "History shows, actually, that in Nazi Germany, one of the first things that they did was add fluoride to the water in the ghettos where the Jews stayed," Matt Leffler of Clearwater said. "Do you guys know where water fluoridation started? In the death camps in WWII." "There have been many links to cancer going back to the original tests on fluoride done by the Nazis on the Jews." "It IS what they used to dull their brains!! They used it in the concentration camps. It was in the concentration camps that they also developed many anti-psychotics." One reader declared the Nazi-fluoride connection "an absolute historical fact." Several readers linked to sources on the Web. Read our analysis to find out why there's no teeth to this claim. 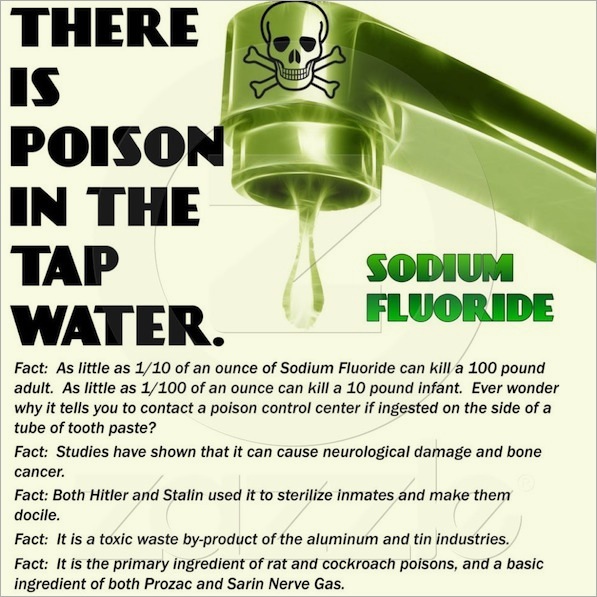 Say water fluoridation started in Nazi Germany ghettos and death camps to pacify the Jews. — Critics of water fluoridation, Tuesday, October 4th, 2011.